Ready to take it back to the old school? 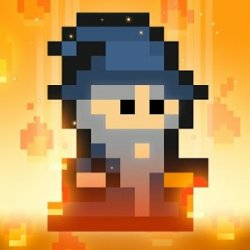 Pixel Wizard Adventure is a brand-new, classic retro-style platform game that’ll take you on a magical adventure of epic proportions! Don your wizard’s hat and grab your magic wand and transport yourself to a magical kingdom for this modern arcade classic. Now available as a downloadable App, Pixel Wizard Adventure is an absolute must-play for any fans of old-school 2D platform and adventure games. If you enjoyed those classic 2D RPG games, then you’re going to love this! In this fantasy platformer, you’ll find yourself transported to a pixelated kingdom shrouded in mystery. You’ll play as a magical wizard facing a difficult and action-packed task: defeat the monsters, ghouls and goblins standing in your way to make it through all kinds of brainscratchingly puzzling levels. In the midst of this medieval madness, you’ll come up against everything from bats and ghosts, to lava pits and obstacles that your wizard will need to navigate his way around if he’s going to save the kingdom! From castles to haunted forests, you’ll need to use your brains (and your magic wand) if you want to make it through alive. • Relive the classic pixel art of those retro RPG arcade games you know and love! • Battle all kinds of monsters, ghouls and ghosts! Through each beautifully-designed level, you’ll need to have your wits about you if you’re going to defeat the forces of darkness! Be sure to keep a sharp eye out though: coins and magic items are littered about the kingdom to help you reach your goal. Collect as many coins as you can through the game to grab that high score! There’s also a whole cast of playable characters to help you make it through the game. Choose from a variety of fun characters to find your favorite before heading out on the magic adventure of a lifetime. Fans of classic arcade games and 2D RPGs will fall in love with the retro pixel art of Pixel Wizard Adventure. Lovingly designed to conjure up the spirit of old school adventure games and platform games, this is a classic platform game with an epic twist! The controls are also as simple as those retro video games – all you need to focus on is navigating your wizard through the challenging levels and avoiding the evil monsters! But don’t let that fool you, this game isn’t always a piece of cake: even expert role playing gamers and arcade adventure games fanatics will find a real challenge. So grab your wand and conjure up the classic years of gaming with Pixel Wizard Adventure! To Download Pixel Wizard For PC,users need to install an Android Emulator like Xeplayer.With Xeplayer,you can Download Pixel Wizard for PC version on your Windows 7,8,10 and Laptop. 4.Install Pixel Wizard for PC.Now you can play Pixel Wizard on PC.Have fun!